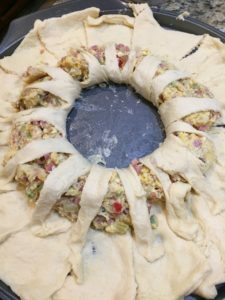 Loaded Scrambled Eggs Breakfast Wreath – Mama, Can I Lick the Spoon? We have finally gotten some cold weather and, boy, am I happy! I love the cold weather! I very much prefer it to warm weather because, let’s face it: I’m a big girl and I have far too many creases for sweat to gather! I also love cold weather because it is soup weather. Now, don’t get me wrong. I can eat soup in the middle of July. But cold weather almost demands it! Gumbo, stews, soups, chili…I love it all. And nothing makes me feel cozier than having a big pot of something bubbling on the stovetop! Unfortunately, my son does not share this love of big pots of bubbling love. He has never been a big soup eater. He LOVES gumbo and chili, but he usually passes on soup. This past week, I made a HUGE pot of Taco Soup. Michael couldn’t eat it because of his low-carbing. It is FULL of beans and corn and all kinds of deliciousness – and carbs. Christopher wouldn’t even eat a single bowl. Elizabeth and I ate many bowls over the course of several days and then I transferred the rest to a big zippered bag and froze it for another day. I came home from work yesterday and decided to make something very un-soup-like so that both kids would be happy. The kids and I love Breakfast for Dinner. Michael tolerates it, but it’s not his favorite. 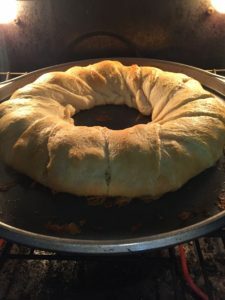 I had several tubes of crescent roll dough in the refrigerator because, in Louisiana, it’s King Cake season and I have to keep ingredients for making my Crescent Roll King Cakes on hand at all times. 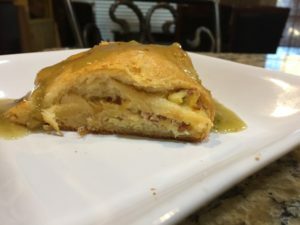 I started with the filling. 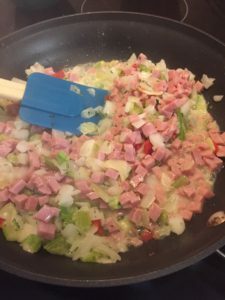 3-4 pats of butter, a cup of seasoning blend, and a cup of diced ham went into a skillet. While the veggies were cooking until tender, I cracked eight eggs into a bowl, added a quarter-cup of heavy cream, and a little salt and pepper – just as I would if I was making scrambled eggs. After whisking all of that together, I added about 1/2 cup of bacon pieces and whisked again. After the veggies had softened and turned translucent, I added the egg mixture and stirred with a rubber spatula, scraping the bottom as I cooked. See? Just like scrambled eggs! 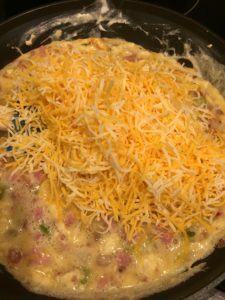 When the eggs were about half-cooked, I added two cups of finely-shredded cheese and kept scrambling. When the eggs were done, but still soft, I took them off the burner and let them cool for a bit while I laid out the dough in the shape I needed. 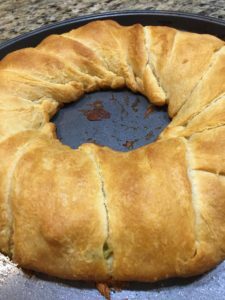 You will need two cans of crescent roll dough. 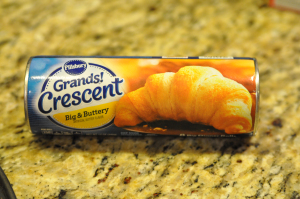 The “big and buttery” ones work best. 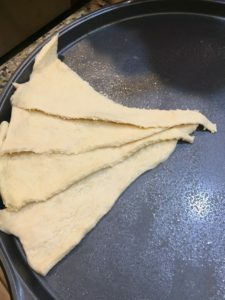 Separate the crescent roll dough into triangles and lay them, slightly overlapping with points inward on a pizza pan sprayed with baking spray. Slide the pan into an oven that has been preheated to 375 degrees and bake for 30 minutes – or until golden. 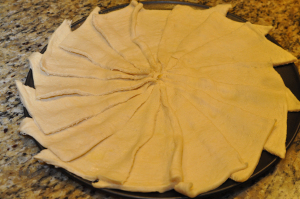 Cut into slices and top, if desired. I topped mine with salsa verde! In a skillet, melt the butter and add seasoning blend and ham. Cook until veggies are soft and translucent. While they are cooking, crack the eggs into a bowl and whisk with the cream and salt and pepper. 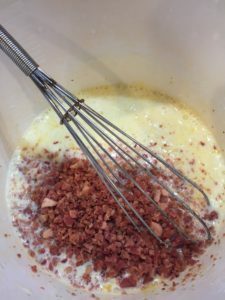 Add the bacon pieces and whisk again. 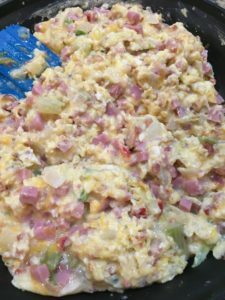 Once the veggies are softened, pour the egg mixture in and scramble the eggs with the vegetables and ham. When the eggs are about half done, add the cheese and continue to scramble until eggs are done, but still soft. Remove the skillet from the heat. 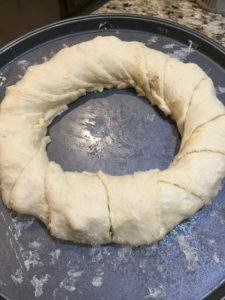 Bake ring/wreath for 30 minutes or until golden. Remove from the oven and cut into slices for serving. Top as desired. Well Duh #1: Please follow the photos for a detailed map of how to make the ring! Well Duh #2: I topped mine with salsa verde. Elizabeth topped hers with sour cream and sriracha. Christopher ate his naked with no topping. Well Duh #3: I refrigerated the leftovers in a sealed container. They heat up fine in the microwave. 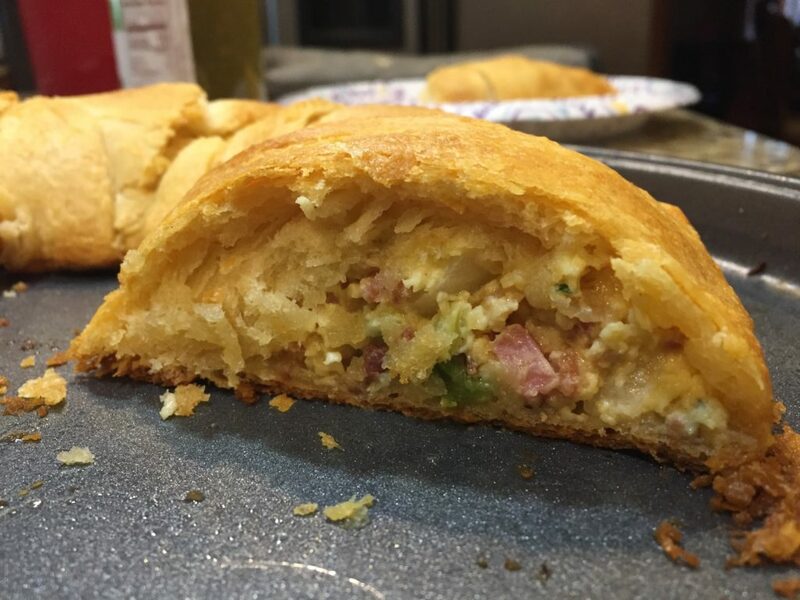 They will lose the “crispness” of the just-baked crescent rolls, but will still be delicious! Well Duh #4: I buy bags of frozen seasoning blend because I’m lazy. What I used in this dish is about the equivalent of half a medium onion, half a bell pepper, and a stalk of celery, all diced. Elizabeth and I loved this dish and had fun choosing toppings for our slices. Christopher came home from work, took one look at the ring/wreath, then looked at me and said, “Thank you for NOT making soup!” He loved it, too! And Michael? What about poor Michael? Well, I had a little over a cup of the filling left over. He was all too happy to take care of that for me! Yummy food = happy family!